Our station serves Humboldt, Northern Mendocino, and Western Trinity counties in Northwestern California. 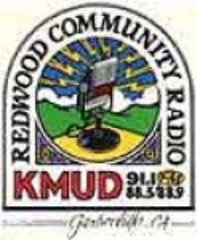 KMUD is owned and operated by Redwood Community Radio, Inc. a non-profit corporation. We've been broadcasting since May 28, 1987. Our programming (90% of which is produced locally) includes music of all kinds (roughly 75% of airtime); news of the region and beyond; public affairs and call-in talk shows. Technical Director / Host of "EuroBureau"